One of my favourite parts of Xamarin is it’s flexibility. Using Xamarin and Xamarin.Forms you can actually jump between Native API’s, Forms APIs and Html5 (generated at locally or on the server). This flexibility has enabled me to develop a range of different solutions for clients based on their situation, I wasn’t sandboxed to Native or PhoneGap, I could mash up anything. The best part is that you can mix these up to with seamless experiences between them. Here’s a graph showing the percentages of technologies I’ve used in my most recent Xamarin Apps, you’ll see some are Forms only, some are Native only, some are a mix of all. Do you have a Xamarin traditional app but need some Crud forms? Go ahead add in Xamarin.Forms, it can be used in Micro Areas of your application. Do you have a Xamarin.Forms app but need to add a little HTML? 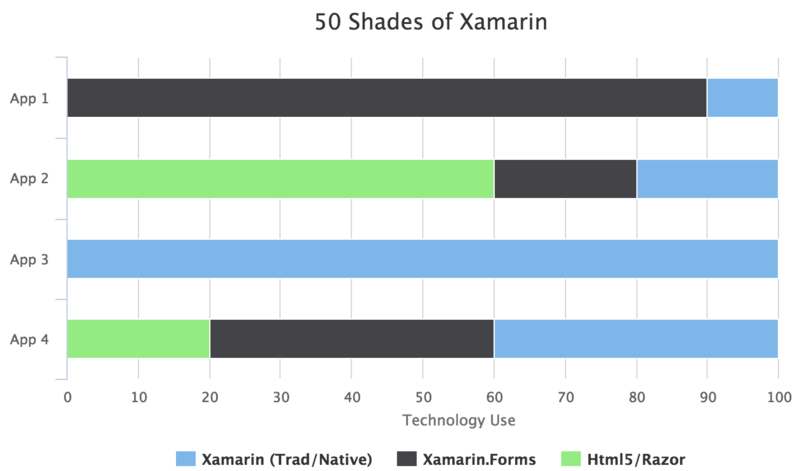 Go ahead with Xamarin you can easily show Html5.